This is a helper for listening to and accepting D-Bus connections. Since Server derives from Initiable, its constructors can throw an exception if construction fails. This can be used to create a new D-Bus server, allowing two peers to use the D-Bus protocol for their own specialized communication. A server instance provided in this way will not perform message routing or implement the org.freedesktop.DBus interface. To just export an object on a well-known name on a message bus, such as the session or system bus, you should instead use Gio::DBus::own_name(). Connect to the Gio::DBus::Server::signal_new_connection() signal to handle incoming connections. The returned Gio::DBus::Server isn't active - you have to start it with g_dbus_server_start(). Gio::DBus::Server is used in this [example][gdbus-peer-to-peer]. This is a synchronous failable constructor. See Glib::dbus_server_new() for the asynchronous version. flags Flags from the Gio::DBus::Server::Flags enumeration. A Gio::DBus::Server or nullptr if error is set. 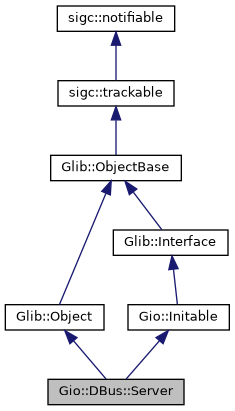 Free with Glib::object_unref(). Gets a D-Bus address string that can be used by clients to connect to server. A D-Bus address string. Do not free, the string is owned by server. Gets the flags for server. A set of flags from the Gio::DBus::Server::Flags enumeration. Gets the GUID for server. A D-Bus GUID. Do not free this string, it is owned by server. A Gio::DBus::AuthObserver object to assist in the authentication process or nullptr. Flags from the Gio::DBus::Server::Flags enumeration. If you want to accept the connection, take a reference to the connection object and return true. When you are done with the connection call g_dbus_connection_close() and give up your reference. Note that the other peer may disconnect at any time - a typical thing to do when accepting a connection is to listen to the Gio::DBus::Connection::signal_closed() signal. If Gio::DBus::Server::property_flags() contains Gio::DBus::Server::Flags::RUN_IN_THREAD then the signal is emitted in a new thread dedicated to the connection. Otherwise the signal is emitted in the [thread-default main context][g-main-context-push-thread-default] of the thread that server was constructed in. connection A Gio::DBus::Connection for the new connection. true to claim connection, false to let other handlers run.